The worst vandalism to the school in years was done last week, when someone entered a storage area in the football tower and used paint to write vulgar graffiti on the east wall of the middle school, on the football tower, on the concession stand, on the shotput pad, and on the track. 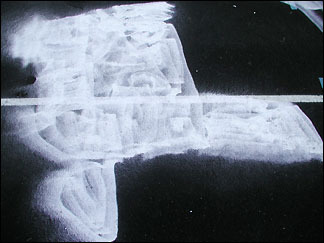 White spray paint, used to paint lines on the football field, was taken from the tower and used to write the profanity-laced graffiti. "This is the worst (vandalism) I can remember," said Lew Storkamp, building and grounds supervisor for the school district. He said it is the most extensive and most expensive vandalism that he has dealt with in 25 years with the district. The vandalism was done either on Tuesday night or early on Wednesday morning, said Paynesville Police Chief Tony Schmitt, whose department is investigating the incident. While most of the vandalism was erased or painted over by the end of the week, removing the white paint from the porous brick of the school wall is proving more of a challenge. The brick wall will need to be sandblasted to remove the paint. High school principal John Janotta believes the vandalism was done on Tuesday night, since a student walking home across the football field after the volleyball game noticed a spray can on the field. The high school is offering a $100 reward for information that leads to the apprehension of those responsible. Officials are especially interested in hearing from anyone who saw anything suspicious on Tuesday night or early Wednesday morning. "It's really unfortunate," said superintendent Howard Caldwell. "It's really something we hate to see happen. We've been fortunate over the years to not have major vandalism." "If someone is out there that knows something or hears something, we'd like to know what that is," added Caldwell. Erasing the vandalism took a great deal of custodial and administration time last week, added Caldwell. Storkamp said the graffiti on the track, on the shotput pad, and on the tower was covered by painting. The concession stand was scrubbed and scrubbed to remove the painted graffiti. "You can tell where it was because we took some of the other paint off," he explained. They might need to paint the concession stand in the spring. 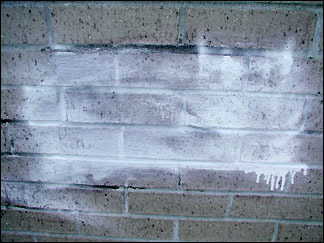 The most troublesome graffiti to remove was the paint on the school wall, since the brick is porous. "We tried everything we could possibly think of (to remove the paint)," said Storkamp, who called manufacturer's representatives for the paint and the track last week to get advice on removing the paint. Graffiti was painted on the track on either Tuesday night, Oct. 8, or early Wednesday morning, Oct. 9. Failing to satisfactorily remove the paint themselves, the custodial staff painted over the words to make the profanity unreadable. Now the school district is planning to have the wall sand blasted to remove the graffiti. The whole area of the wall will need to be sandblasted to avoid leaving distinctive marks where the graffiti was. Storkamp expected the sandblasting to be done this fall, as soon as possible. Storkamp is tracking the district's expenses, including staff time, in dealing with the vandalism. The school district has a $1,000 deductible, which is the maximum out-of-pocket cost to the district, with insurance covering the rest. Local police, along with school administration, are investigating the incident. Schmitt said the graffiti did not appear to be gang-related. The graffiti also did not make any reference to local students or staff. It was generically vulgar. Janotta said one encouraging thing last week was the reaction of the student body to the vandalism. The students, he said, were appalled by the vandalism to the school buildings and grounds. A number of students told him that Paynesville is better than such things. Schmitt believes the vandalism is related to two incidents in the nearby Chladek Addition that same night. A truck was driven and returned on Burr Street and another truck was stolen on Maple Street. The stolen truck, a 2000 Chevy, has still not been recovered, and Schmitt hopes that it might provide clues to the case. With two trucks stolen last week and another taken and returned, Schmitt stressed the importance of not leaving keys in vehicles. In all three cases last week, keys had been left in the vehicle.